I saw the Spicy Chipotle Chocolate Cake from What We’re Eating and have wanted to do it for awhile. I love Mexican hot chocolate so I thought they that I would enjoy this too. Our friend Essa is going back to Egypt to sort some Visa issues out so decided to make these his ‘pot luck good luck send off’. It was fun to bring them to the pot luck dinner because I was able to have quite a few reviews of it. Everyone liked them but they liked the cake and frosting seperately. The cake gave you a hint of chili about the 3rd bite in, a slow mellow burn. They could not taste any nutella in the frosting, just cream cheese. But people like the frosting since they were eating it out of the mixing bowl (frosting them there made transporting them a bit easier!). I will try it again with a plain chocolate buttercream frosting so the cream cheese does not battle with the chipotle. Such a good cake, I know I’ll make it again.Amanda had a great idea with the chili/chocolate combination. So good! Preheat oven to 325 degrees. Line 24 cups in cupcake pans with wrappers. Set aside. In a medium size bowl, sift together the salt, flour, baking powder & chipotle chili powder. Set aside. In a large mixing bowl/stand mixer, combine the eggs and sugars. Beat until the sugars have completely dissolved into the eggs and the mixture begins to thicken- 3-5 minutes. While the egg/sugar mixture is mixing, melt the butter in a double boiler. Once the butter has melted, add the chocolate chips. Stir until all chocolate has melted. Do not burn chocolate. Remove from heat. Divide the batter evenly among the cupcake lines. Bake at 325 for 25-30 minutes, or until a toothpick comes out clean. (If it comes out with any gooey batter, let the cake bake longer, as needed.) Remove the cupcakes from the oven and place on a wire rack to cool. Cool for at least 2 hours before frosting, store frosted cupcakes in a cool place/refrigerator. 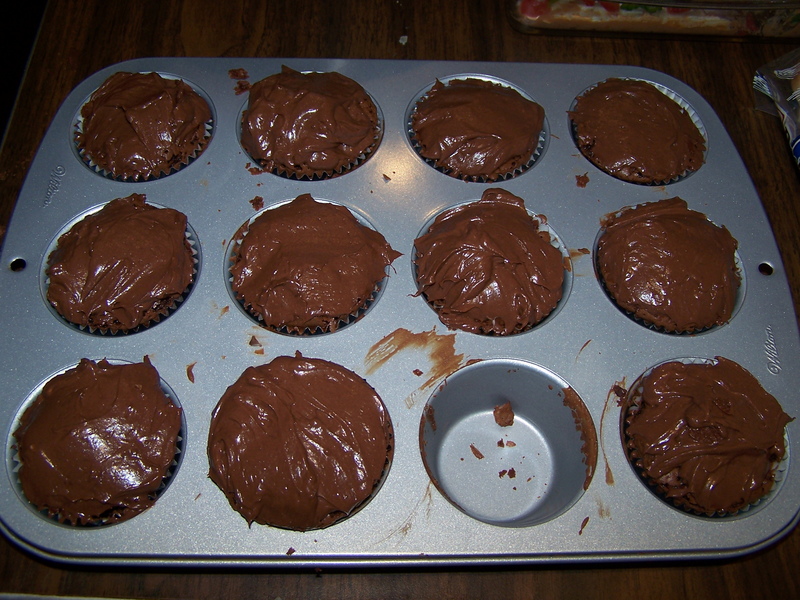 Once cooled, the cupcakes may be covered and stored at room temperature for a day before frosting. Using a larger bowl and electric beater or standmixer beat the the cream cheese and nutella into until light and fluffy. Sift in the cocoa powder and powdered sugar. Add the milk then then gently beat to incorporate. Beat until the frosting is light and fluffy. Frost cupcakes!